She would have driven the backhoe, dug the swimming pool and plumbed the pipes, but Suzy Soto merely removed the turtle grass, drove a truck and bore children. She also oversaw front-of-house functions and did the hiring as she and husband Eric created and ran their East End “dream resort,” the Tortuga Club, in 1963. 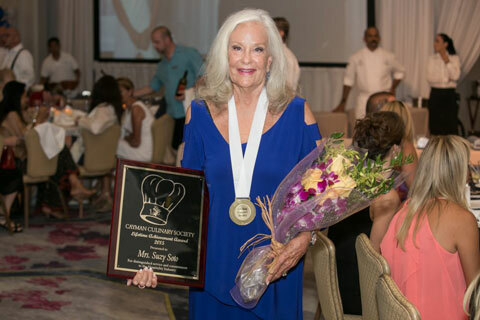 Hotel and restaurant pioneer Suzy Soto received the Cayman Culinary Society’s Lifetime Achievement Award for her distinguished service and commitment to Cayman’s hospitality industry. The appellation came nearly a decade before men with backhoes and pickup trucks full of rocks built Owen Roberts International Airport on a giant swamp – not to mention the road linking George Town and East End. Time has caught up with the Cayman Islands, if not the phrase – making subsistence farming, fishing and turtling, rope and basket weaving, as well as mosquitoes, unrelieved humidity and wattle-and-daub construction, matters of cultural heritage. Today, East End is integral to the eastern districts, growing faster than anywhere else. But development started slowly, when Suzy and Eric Bergstrom opened their hostelry after fleeing the freezing urban wastes of Chicago for the Cayman Islands. It almost never happened, because the pair had been looking in the wrong place. “We were looking at the U.S. Virgin Islands,” says Ms. Suzy, now surnamed “Soto” after her 1981 remarriage to entrepreneur and scuba diving doyen the late Bob Soto. The remark is typical Suzy Soto: droll, direct, descriptive, dauntless. She has been in business – one of Cayman’s original “women in business” – for 52 years and displays not a suggestion of slowing down. She is about to publish her first narrative – a biography of Bob Soto, who died in May this year. She published a cookbook in 1995. “We had 300 feet of land in East End and Eric and I built and opened the Tortuga Club in nine months,” she says, recalling him riding a bulldozer, ploughing up two miles of sand for an access road. Underlining the point is the story of Tortuga’s first guests. They did not arrive by road, but by sea: a dozen shipwrecked Portuguese sailors – and a monkey. “They were the crew. They had been rescued from the reef, from the Ramabamibajuu, and brought to shore, where they checked in with us. There wasn’t much English spoken,” she says, noting the chaos. Among association founders was “Scotty,” a British manager with F&B experience in Chicago, who quickly created his eponymous liquor retailer, Jacques Scott. On the heels of the Hotel Association came the wider Caribbean Hotels Association, founded in 1968 with 67 members, the Tortuga Club among them. Because 90 percent of small hotels in the Caribbean were going bankrupt, “ripped off in the U.S.” by cut-throat industry chiefs, Ms. Soto said, “we founded a small hotels advisory council with the CHA. She did hotel inspections, closing several, and recalled one in Barbados that refused to shut. One week later, 18 visiting travel agents came down with food poisoning. She served as CHA regional director and chairman of its Training Committee. She helped found its Small Hotels Advisory Council and wrote a 300-page manual for small-hotel operators while running seminars for management and staff in a range of tourism-related interests. At one point, dabbling in graphic design, Ms. Soto created the iconic “Sir Turtle” logo, dressed in a top hat and cane and, later, in dive clothes. Today, Sir Turtle has a peg leg and wears a scarf, and adorns every Cayman Airways aircraft, although in 2007 he moved from the tail to the passenger door of the 737-300 fleet. “A New York ad agency told me it was the best icon they’d ever seen, and wished they could invent something like that just once,” Ms. Soto said. She and Mr. Bergstrom ran the Tortuga Club for nearly 15 years until they sold it in 1977, one year after her election to the CHA board of directors and the same year she gained a seat on the Cayman Islands Government Tourism and Industry Training Board. Big changes, however, already were looming when, in 1976, Cayman’s first major dive operator opened a lodge down the road from the hotel. They got along well enough, however, although it took another few years for a relationship to blossom. Between 1978 and 1981, Ms. Soto added property management to her resume, running the London House Condominiums on Seven Mile Beach. In 1980, Mr. Soto sold Bob Soto’s Diving, Ms. Soto parted ways with Mr. Bergstrom – who served voluntarily for seven years as head of tourism, but finally gained appointment as full-time director of the new Department of Tourism, where he spent 25 years – and the hotelier and the dive master married. Lest the duo dally in wedded bliss, however, the new Mrs. Soto, drawing on 18 years of food-and-beverage service, took her new husband’s advice to buy a liquor license, and promptly opened the original Cracked Conch in Red Bay Plaza – while moving the family to Frank Sound. Daughter Sheree, a Butterfield Bank executive, ran the restaurant with her husband Davy Ebanks, until she returned to banking. Davy remained, however, and the restaurant moved to Regency Court in West Bay Road in 1985. The same year, Ms. Soto served as president of the new Restaurant Association, occupied a seat on the Tourism Awareness Committee and the Awards Committee for the tourism industry. In the midst of all this, the Regency Plaza owner, Ms. Soto said, decided he “didn’t want us there,” although the details remain sketchy. “I was not going to give up, though, and my friends told me to move and not look back.” She remains proud of the 1995 overnight move to Northwest Point, near the Turtle Farm. Well … not quite, but by no accident: Ms. Soto, with the help of lawyer son James Bergstorm, comped another round of 2,800 meals in the wake of 2004’s Hurricane Ivan. In 2001, the new Cayman Islands Tourism Association named her director and vice president of the restaurant sector. In 2003, she won the Certificate of Honour and was named to the Quincentennial Wall of Honour for contributions to the Cayman Islands and tourism. Meanwhile, Bob raised the funds and Suzy spent two years gathering 477 names of Caymanians who had lost their lives at sea, in wars and service to country, creating the Seaman’s Memorial, now in Heroes Square, unveiled by Prince Andrew in 2003. In 2005, after two decades, she sold the Cracked Conch, although the restaurant still reserves its “Soto Room” for meetings and private dining. She started the Cayman Heart Fund in 2007 after herself receiving a pacemaker, and today remains chairman emeritus. She still owns two properties, Soto Villas in Snug Harbour and the two-villa, eight-bedroom Sir Turtle Beach Villas in Little Cayman. Ms. Soto said she “never met much” gender prejudice, but said “I was strong,” and if discrimination occurred, “well, maybe I just ignored it. She tells of one hotel vendor that persistently asked to speak to her husband: “I told him, ‘look, I run this place and you’re just going to have to deal with me.’” He never questioned her again.